Raw is an open web app to create custom vector-based visualizations on top of the amazing D3.js library through a simple interface. 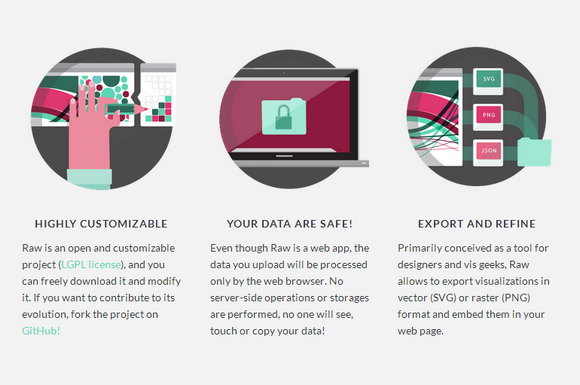 Even though Raw is a web app, the data you upload will be processed only by the web browser. No server-side operations or storages are performed, no one will see, touch or copy your data. Raw works with delimiter-separated values (i.e. csv and tsv files) as well as with copied-and-pasted texts from other applications (e.g. Microsoft Excel, TextWrangler, TextEdit. Based on the svg format, visualizations can be easily edited with vector graphics applications for further refinements, or directly embedded into web pages.